Whelkhome - limited edition etching. 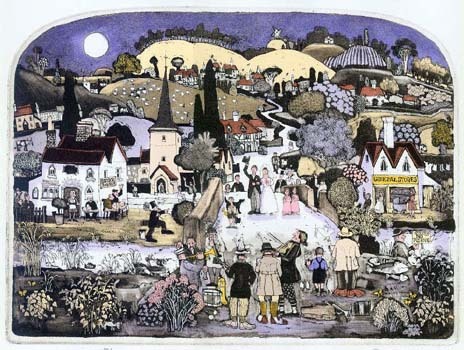 Born in 1941, Graham Clarke was educated at Beckenham Art School, where he fell under the spell of Samuel Palmer's romantic and visionary view of the Shoreham countryside. At the Royal College of Art he specialised in illustration and printmaking. The famous 'arched top' etchings, with which Graham Clarke established a widely successful reputation in Britain and overseas, came to public attention in 1973 when the first of these, Dance by the Light of the Moon, was exhibited in London at the Royal Academy of Arts Summer Show, and sold out. Examples of his work are held by Royal and public collections, including the Victoria and Albert Museum, the British Museum, the Tate Gallery and the National Library of Scotland in the United Kingdom, as well as by Trinity College, Dublin, the Library of Congress in Washington, D.C., the New York Public Library and the Hiroshima Peace Museum. 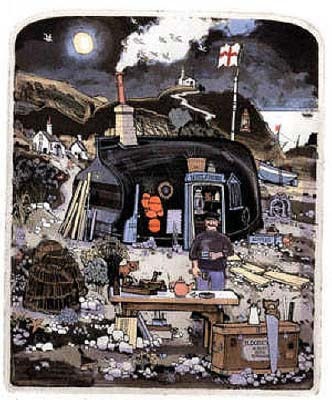 All Graham Clarke's etchings are produced entirely by hand on copper plates, using techniques dating back several hundred years. The inked plate is pressed into the paper, creating the distinctive 'plate mark' indentation. No photographic or digital technology is ever used in Graham's work.